It may be associated with cheap holiday deals, but for those considering Spain holidays, the Costa Brava, just south of the Pyrenees in the region of Catalonia, offers far more than sangria and tacky souvenirs. Costa Brava is translated as ‘Wild Coast’, its 160 kilometres of dramatic coastline in Spain’s north-eastern corner give it a natural beauty. The regular sunshine, along with its easy access from the UK, keep this region a firm favourite with a wide range of holidaymakers. Costa Brava holidays cater for art and history lovers with the area’s rich cultural heritage, and the region is dotted with medieval towns and ancient castles. As for accommodation, there’s more to Costa Brava hotels than modern high-rises. 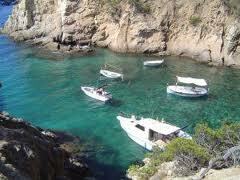 Costa Brava’s Mediterranean climate guarantees long hot summers and relatively short, mild winters. With average temperatures of around 22° Celsius, often reaching 30° Celsius in the summer, the region regularly enjoys 12 hours of sunshine a day. The hottest months of July and August are often tempered by coastal winds. May and June are great times to visit, with temperatures of 23° Celsius, and fewer crowds. Spring and autumn are wetter, although rainfall on the Costa Brava is only about 600mm per year. The warm autumns see temperatures of between 21 – 24° Celsius. In winter, there are still about six hours of daily sunshine, and the days are crisp and bright. Sun cream, shorts and flip flops should definitely be in your Costa Brava holidays luggage. At the other times of year, you’ll be grateful for a jacket or cardigan. You may find it hard to drag yourself away from the Costa Brava’s many miles of beaches, but it’ll be well worth the effort. You certainly won’t be bored on Costa Brava holidays. From the excitement of regional capital Barcelona to the mind-blowing Surrealist art of the Dali museum at Figueras, from the drama of Montserrat’s Benedictine monastery, to the sheer fun of Europe’s biggest water park, just outside Lloret de Mar, or the Botanical Gardens at Blanes, you’ll be wondering how to fit it all in, not struggling to fill your time. The Marineland complex near Blanes is hugely popular, especially with families. Kids of all ages love the dolphin, sea lion and parrot shows, reptile house, children’s zoo and boating lake. The cuisine of the Costa Brava incorporates traditional Spanish food with local fare – such as mar i muntanya (‘sea and mountain’), an appetizing way of combining seafood with land produce. And don’t forget to try crema catalana – the region’s version of the French creme brulee pudding. The area stages a variety of annual carnivals and festivals – with each town’s Festa Major involving merrymaking and dancing. Colourful processions are the order of the day at Easter, and many places hold summer music festivals. Carnival in February offers another excuse for frantic partying. All year round, it is possible to see the sardana – traditional Catalan dance – being performed. The Spanish love to party, making nightlife an essential part of most Spain holidays. The Costa Brava is no exception, and, as you would expect from such a diverse region, evening entertainment is rich and varied: leisurely and relatively low key in resorts like Blanes and Calella, much livelier in Lloret de Mar, where there are enough bars, discos, organised beach antics and foam parties to keep the most energetic reveller happy for a fortnight on holidays to the Costa Brava. Tossa de Mar, popular with locals and tourists alike, also boasts a variety of restaurants, cocktail bars and discos. But if chilling out over a quiet meal is more your thing, check out the local seafood and traditional tapas, in one of the region’s hundreds of restaurants. Or enjoy a sundowner at a beachfront bar. Whether you’re after the buzz of late-night dancing, or mellow evenings unwinding, the Costa Brava has something for everyone after dark. The Costa Brava’s beautiful landscape combines beaches of pebbles or golden sand and crystal clear waters with rocky promontories and little coves backed by sheer cliffs topped with pine and oak forests. The interior is equally stunning, with pristine medieval villages set in lush, Mediterranean landscapes. A short drive to the east takes you to the wooded hills of the pre-Pyrenees. The region’s mosaic of Mediterranean villages like L’Escala, Palamos and Sant Feliu de Guixols, are especially charming, draped in rocky outcroppings and green pines as they swoop down towards the golden waters of the Mediterranean. Unspoilt corners, nature reserves and artistic enclaves all challenge the popular perceptions of this region as a concrete jungle devoted to sun, sea and sangria. A renaissance of local culture, sensitive building and respect for the ‘brava’ (wild or savage) scenery that gives the coast its name make the Costa Brava the perfect destination for your holiday in Spain. Northern Holidays has superb offers cheap Costa Brava holidays, so book today and experience the variety and excitement of this unique destination!